This item is available in several color options. Please refer to the overview for ordering instructions. 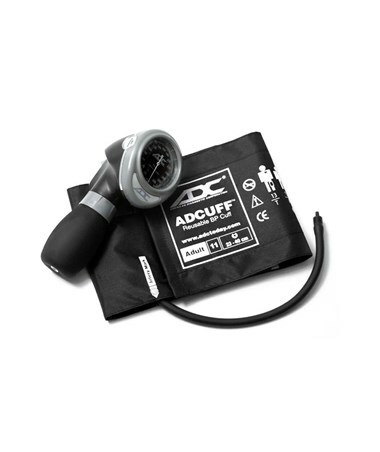 Every busy clinician knows that accuracy, comfort, portability, and ease of use are vital in blood pressure management equipment. 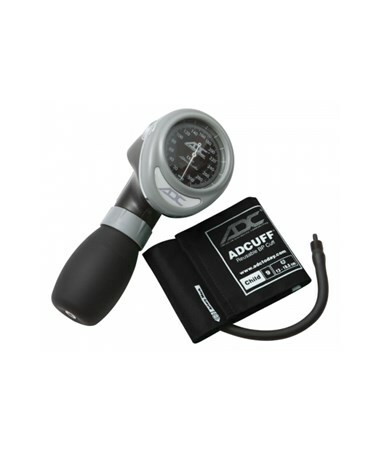 ADC's Diagnostix™ 703 Series Palm Aneroid Sphygmomanometer is the perfect tool, encompassing all components of top-of-the-line instruments in a lightweight, compact, and economical package. 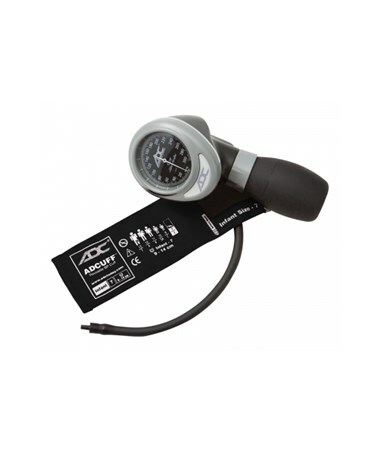 The 703 Series features a revolutionary palm-style manometer (804), an attractive, comfortable, virtually indestructable aneroid. The gauge's Japanese-engineered movement has been tested to 50,000 cycles, over 5 times the requirement under ANSI SP10, and is housed in a zinc safety cage within its rugged ABS casing. 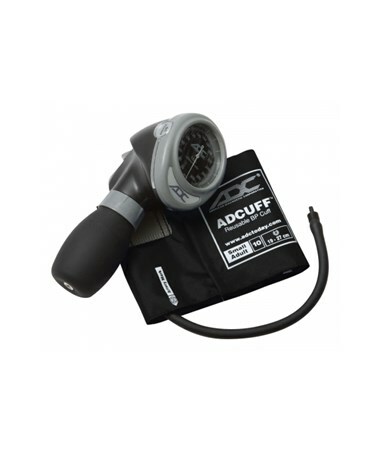 It boasts a versatile trigger-style ergonomically advanced design for ultimate comfort and easy, ambidextrous use. 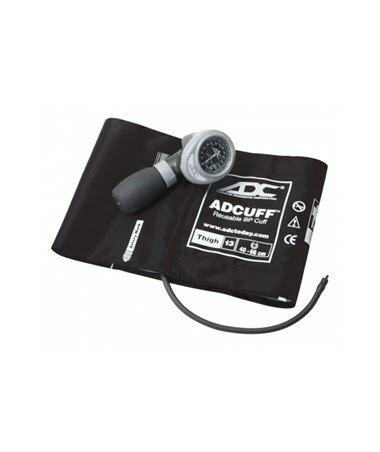 Its luer slip connector and integrated inflation system allow for maximum simplicity and speed in cuff changes and one-handed use. For convenience, portability, and instrument protection, the unit arrives complete with a leatherette carrying case. The case features a durable, self-repairing nylon zipper for extended life and extra security. 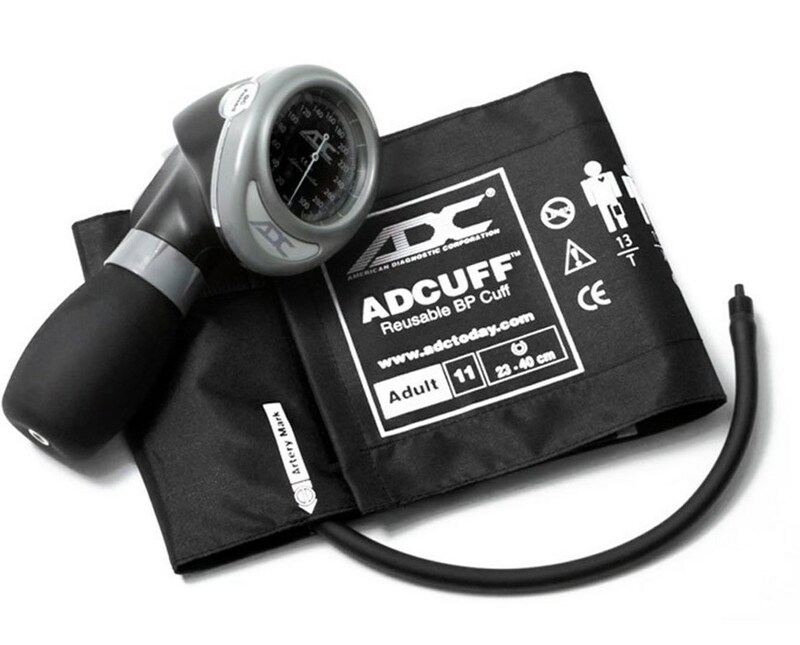 The aneroid is fully equipped with a latex-free Adcuff™ nylon cuff with ADC’s proprietary Size Guide™ marking system to prevent mis-cuffing. 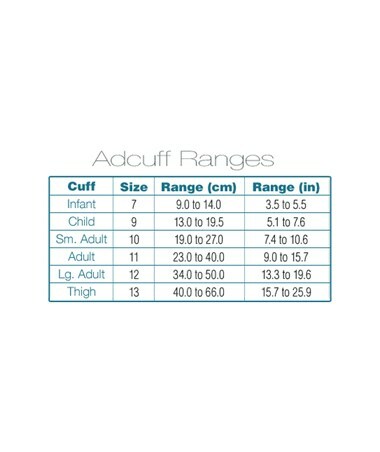 The 703 Series is available in cuff sizes infant, child, small adult, adult, large adult, and thigh. View the chart below for sizing information. Select a size from the drop-down menu in the upper right corner of this page. 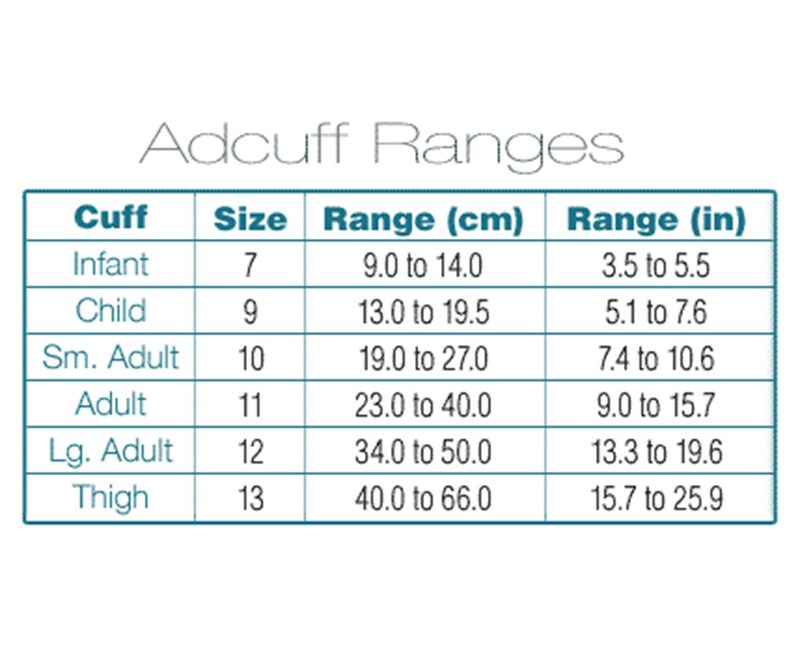 These durable, comfortable cuffs are available in a wide variety colors; select all in one color for uniformity or each size in a different color for easy differentiation between sizes and a simple way to add cheer to the exam. Please refer to the color guide below to view options. 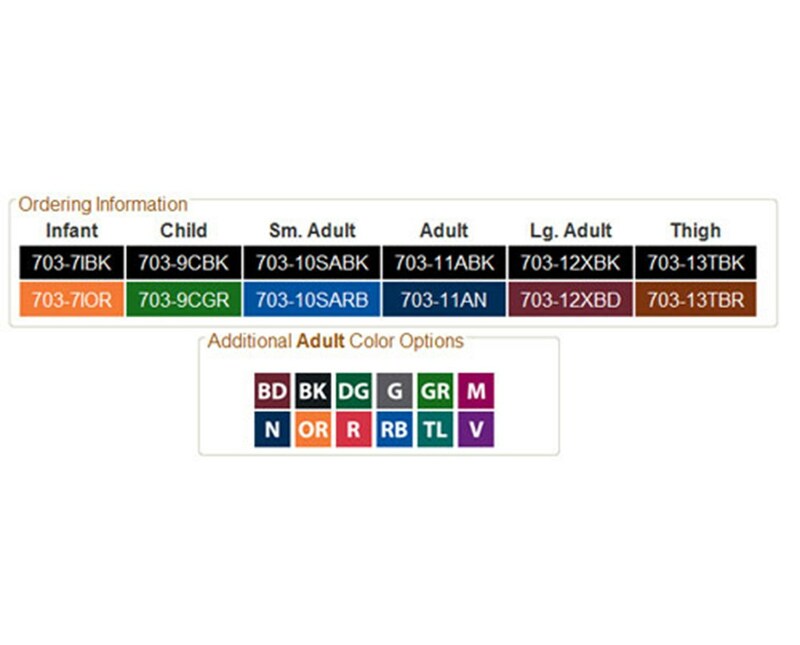 In addition to the colors listed in the drop-down menu, there are 7 more colors for the Adult size; Gray, Hunter, Purple, Teal, Red, Navy, and Magenta. To order these additional colors, give us a call or leave us a note stating your color choice when placing your order. Base 7.82" X 4.5" X 2.75"